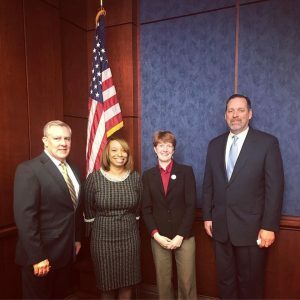 A panel of Community Health Center leaders from around the country was on Capitol Hill today to brief Congressional staff on the services they provide to more than 28 million patients or 1 in 12 Americans. The national network of locally run health centers is a lifeline in some of America’s most economically challenged communities. They provide affordable primary care services, improve health outcomes among the chronically ill and lower health care costs. 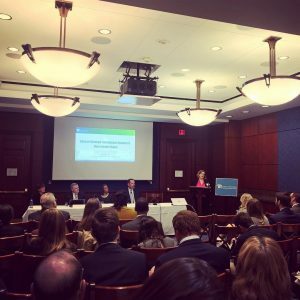 Yet, panelists told attendees that the program, which has long-standing bipartisan support, needs long-term, stable funding to make it possible for health centers to continue to address major public health challenges, including the national opioid epidemic. The panel of health center leaders included: Cam Kliebrink, CEO of Frontera Health Network, Eden, TX; Kendra Holmes, Pharm.D., Vice President/COO, Affinia Healthcare, St. Louis, MO; Larry McCulley, President/CEO, SIHF Healthcare, Sauget, IL; Barbara DiPietro, PhD, Senior Director for Policy, National Health Care for the Homeless Council, Baltimore, MD. Each panelist described the innovations the health center model has developed to address all manner of public health challenges, including chronic disease, homelessness, mental illness, substance use disorders and lack of access to care. Cam Kliebrink, who runs a health center in rural Texas, described how telehealth technology has helped bridge the gap in access to behavioral health services and reduces the “windshield time” for providers to see patients. “For us, telehealth is huge,” he said. He also described how the health center he runs and EMS are the only options for care in two counties that span one thousand square miles. Dr. Kendra Holmes, a pharmacist with Afinia Healthcare, spoke about the challenges of treating opioid use disorder — which triggered 914 overdoses in the state last year. In addition to providing treatment for substance use disorders, Holmes talked about her health center’s efforts to address other underlying challenges for patients, such as lack of housing, food insecurity, violence, and trauma. Holmes added that funding support has helped her health center address the complex issues patients suffering from opioid disorder often face. Health centers experienced a five-month lapse in mandatory health center funding last year. The funding shortfall was eventually fixed on a temporary basis by Congressional lawmakers, but it also triggered widespread disruption to health center operations in areas such as staffing, finances, and planning for patient services. Health centers face a similar scenario this year unless Congress acts by the end of September. Funding support is key to the health center model of addressing the health needs of special populations, especially those who typically have difficulty getting health services and consequently turn to emergency services for care — such as the homeless. Barbara DiPietro, Senior Director for Policy, National Health Care for the Homeless Council, talked about the high rate of emergency room utilization among the homeless and the endemic rise of homelessness in urban and even suburban and rural areas. “Poor health can cause homelessness,” said DiPietro. “It doesn’t matter if you have insurance, if you are sick and you can’t work, your circumstances can quickly change. Also, homelessness can cause poor health and makes engagement with health care providers even more difficult.” Health centers care for 1.4 million homeless patients. The Congressional briefing, entitled, “Health Centers – Addressing America’s Health Care Needs,” comes as the National Association of Community Health Centers (NACHC) unveils a new policy agenda at their national conference in Washington, the Policy and Issues Forum. NACHC also released an issue brief: “Community Health Centers: A Guide to a Vital Network of Care.” The report documents health centers’ success in providing comprehensive and affordable services to a patient population that is largely low income, chronically ill and who typically face difficulties affording essential health services. The NACHC report details how health centers have launched innovations aimed at improving access to care and reducing costs, including making available telehealth for a range of services that include behavioral health, special care, and oral health. Health centers were also early adopters of electronic health records – 99 percent of all health centers have integrated this technology into patient care to track results and outcomes. Responding to the rising incidences of overdoses and deaths from the opioid epidemic, health centers have also boosted their behavioral health staff by 254 percent in the last 10 years. Health centers also care for a growing patient population of veterans – more than 355,000 – and 1 in 5 rural residents in areas where the nearest hospital or doctor can be as far as 50 miles away. A majority of health center patients (82 percent) are uninsured or publicly insured. The NACHC conference, which kicks off this week, draws thousands of health center leaders and advocates from around the U.S.
To learn more about the NACHC 2019 Policy and Issues Forum please visit this link and follow #NACHC19PI on Twitter.